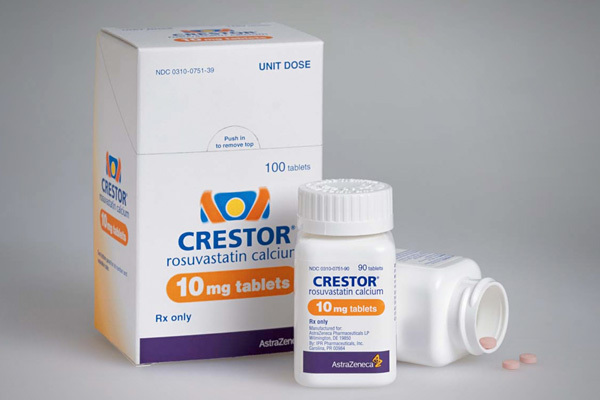 Crestor is brand name for the generic prescription drug Rosuvastatin in the group known as statins. Statins are used to treat individuals with high cholesterol. Cholesterol comes in two types – LDL and HDL. While HDL cholesterol is not harmful and can actually be good for your body, LDL can be harmful when it becomes too high. Statins help with this problem by lowering LDL cholesterol levels. Lower cholesterol can in turn lower your risk for atherosclerosis. Crestor is taken as a pill and can be obtained in four doses – 5 mg, 10 mg, 20 mg and 40 mg. Most patients are started on 10 or 20 mg. Specific dosage recommendations depend on the starting cholesterol levels of the patient. Dosages are typically adjusted over time in keeping with the amount of progress made on this medication. Crestor lowers several types of harmful cholesterol including LDL cholesterol, triglycerides, ApoB, and VLDL cholesterol. It also helps raise HDL cholesterol, which is good for you. Patients with dysbetalipoproteinemia, who have issues with both high cholesterol and high triglycerides are especially well suited to treatment with this medication. Crestor helps patients at risk of atherosclerosis and heart disease lower their overall risks over time. 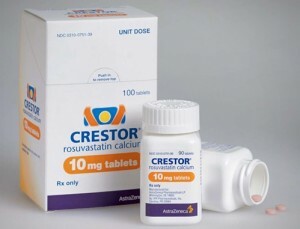 Crestor is a statin medication that works by blocking the effects of HMG-CoA reductase, which is an enzyme that controls the amount of cholesterol produced by the liver. This results in the liver producing much less cholesterol over time and lowers the amount of total cholesterol in the bloodstream. Dosage for Crestor will vary for each person and is dependent on his or her age, existing medical conditions, current medications and cholesterol level. Crestor is available in strengths ranging from 5 mg to 40 mg and is taken once a day. The majority of patients beginning treatment with Crestor take the 10 mg tablets; although the 20 mg and 40 mg tablets are prescribed if the patient is not meeting his or her cholesterol goals. In the event a patient misses his or her scheduled dose of Crestor, he or she may take the missed dose; however, two doses of Crestor must not be taken within 12 hours of each other. Crestor should be stored at room temperature and away from sources of heat, moisture and light. Patients should inform their physician of all prescription and over-the-counter medications, vitamins and herbal supplements they are taking since Crestor has the potential to negatively interact with a number of medications. This list includes birth control pills, antacids, other statin medications, protease inhibitors, red yeast rice and warfarin. Although Crestor is usually very well-tolerated by most patients, there is a risk of side effects with any medication. Muscle aches, joint pain, headache, nausea and constipation are the most common side effects associated with Crestor. If a patient experiences fever, dark colored urine, swelling, upper stomach pain, hives, jaundice, loss of appetite or difficulty breathing, he or she must immediately discontinue use of Crestor and contact his or her physician. Individuals with hypothyroidism, liver disease, liver failure and kidney disease or kidney failure must first consult their physician before using Crestor. Women who may become pregnant or are currently pregnant should not take Crestor as there is an increased risk of the medication causing harm to the fetus. Women who are currently breastfeeding should also not take Crestor since it may pass through breast milk. Alcohol should not be consumed while taking Crestor since it raises the risk of the patient suffering liver damage and can increase triglyceride levels. People taking Crestor should exercise regularly and consume a healthy diet while avoiding foods that are high in cholesterol or fat. If healthy living habits are not practiced on a consistent basis, the effectiveness of Crestor will be lowered.